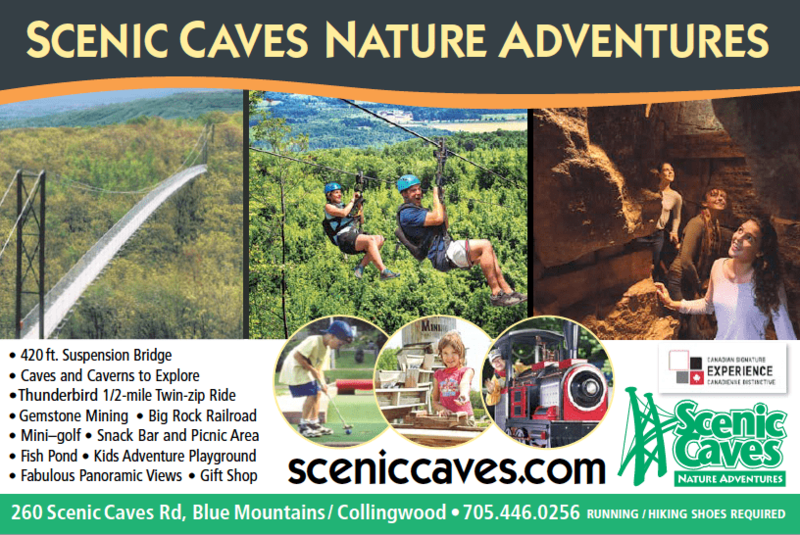 Adventure is your classroom at Scenic Caves! Connect to the living world around you! Explore a self-guided tour of caves, caverns and crevasses. Study the geological features carved millions of years ago by glacial ice. Examine the rare flora, fauna and undergrowth. Discover the mysterious sacred places of the First Nation’s Huron Petun tribe. Venture over a 420 ft. Suspension Bridge and view the spectacular 10,000 sq. km. geography of the area. Sift through semi-precious gemstones using a panning tray with a screen bottom at the man-made water tower. Observe physics while soaring down the half-mile Thunderbird Twin Zip Line (height/age/weight restrictions apply). Our outdoor educational offerings are experiential and stimulate imaginations at any level. For Grades 4 – 8, we offer complimentary educational materials which have been written for teachers by teachers, and meet the expectations outlined in the Ontario Curriculum for Science. Each unit includes lesson plans, ‘fun facts’ and work sheets.